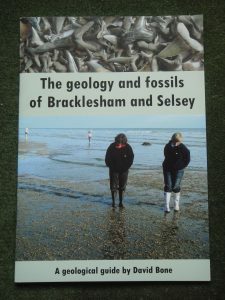 Two brilliant guides have just been published that are a great guide for anyone wishing to explore the rocks and fossils of Bracklesham and Bognor in West Sussex. David Bone is the author and he’s well known to Rockwatch members as he has led us on trips to the area. In fact, there’s another one that he is leading on Monday April 10th. (Places are filling up fast so book quickly if you’d like to come along!) His guides will give you helpful information including sites, sketch maps, glossary of terms used and reading lists as well as lots of photographs of the fossils. There are two titles: ‘The geology and fossils of Bracklesham and Selsey’ and ‘Bognor’s Rocks – a geological guide’. They are available from the author for £4.00 each plus p & p.
Just go to the West Sussex Geology website and contact David Bone, the author.